The Balmes Residence Hotel offers apartments measuring between 35 and 57m² with fully-equipped kitchen, one to three bedrooms and separate lounge/dining room. They can accommodate a maximum of 4 people. Located in a newly-renovated and quiet Catalonian modernism-style building, the apartments are characterised by their high ceilings, elaborate mouldings and paintings and the typical cement tiles of the time. 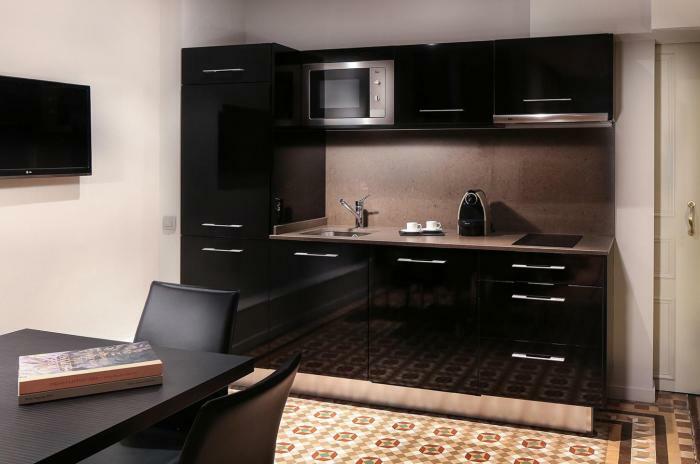 The apartments at the Balmes Residence Hotel are ideal for families visiting Barcelona or business travellers requiring a medium or long stay in the Catalonian capital. Decorated with great taste, character, comfort and modernity, the apartments are the only apartments in central Barcelona with a wooded garden and outdoor swimming pool. All of the rooms and apartments at the Balmes Residence offer individual air conditioning, 24-hour room service, satellite TV channels and Canal Plus, direct telephone, minibar, safe, laundry and ironing service, hair dryer and bathroom amenities.